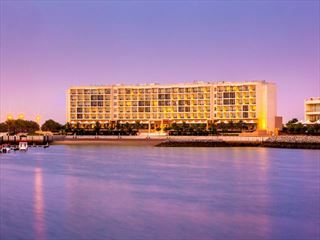 The Hilton Salalah sits by the shores of the Indian Ocean, in beautifully tended gardens, surrounded by coconut trees, papaya and banana plantations. It is an oasis of calm, offering guests an idyllic environment to enjoy the sunshine and the beauty of the Indian Ocean and its seemingly endless horizon. The staff are friendly and attentive, offering impeccable service whenever required. 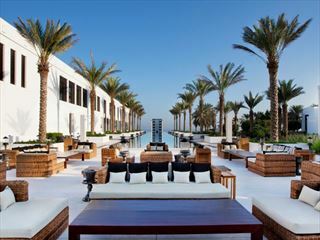 The design of the hotel is modern, but subtly reflects Omani heritage. Guests can enjoy an array of land and water activities, including diving to explore the local reefs. The resort’s free-form swimming pool overlooks the white sand beach and provides a great place to relax in the sun. There’s an excellent choice of cuisine, a fitness centre to work off the calories and a shopping mall for some retail therapy. Children love the kids’ playground and pool. Hilton Guest Rooms- A stylish room with separate seating area and high-speed internet access. Work at the large desk in the working area, take time off in the easy chair or sofa and gaze at the mountain view. Special touches include magazines, mineral water, chocolates and fruit. Deluxe Rooms- A stylish room with separate seating area and a balcony with a partial sea view. Catch up on work at the large desk in the working area, surf the web with high-speed internet, or relax on the sofa. Spoil yourself with magazines, mineral water, chocolates and fruit. Deluxe Plus Rooms-Enjoy the garden and sea view from the balcony of this room with separate seating area. Catch up on work at the large desk in the separate working area, check your email with high-speed internet access, or just relax on the sofa. Suites - A luxurious suite to savour the mountain or sea view from the balcony. Enjoy a meal at the dining table, surf the web with high-speed internet or just relax on the sofa. Spread out in the Grand Suite, with living room and second bathroom. 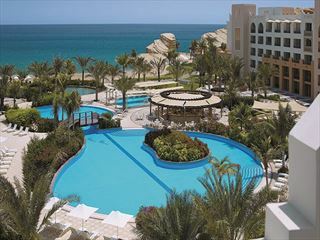 Take an invigorating swim in the free form pool overlooking the white-sand beach at the Hilton Salalah Resort. Landscaped with palm trees, this temperature-controlled swimming pool complex includes an infinity pool, water slide and kids’ pool.